We have been using MIDAS for about 7 years and find it to be an excellent system to manage room bookings and have recommended it to many! I would like to commend you on the tech support that you provide. I am always impressed at the speed and efficiency you are able to provide. You have a fantastic product and superior service! I just realized ... I never told you how much MIDAS has improved our way of scheduling. It's great and I love it! You folks have been fantastic at helping us with requests and I'd be happy to encourage anyone to use MIDAS! I love your product and will recommend it to anyone who has a similar need! Service and support has been top notch! I have looked at a variety of other software and MIDAS is the most comprehensive for what we are looking to use it for! I am certain that with MIDAS and the support you guys give (which incidentally is what swayed the sale) our little charity is going to go from strength to strength! The whole package is working beautifully for us and the more we are using this the better it gets! ... I can't tell you how happy we are! ... The whole thing has reduced my workload enormously ... The best thing I have ever done is buy MIDAS, the support is second to none! I take my hat off to you for your response and the turnaround to my queries ... We love MIDAS :) ... If you have any customers asking for reference sites, I would be more than happy to be of service. Our operations staff are giving excellent feedback about the software after about 4 months of use. If anyone asks me about bookings software I will certainly be recommending it! I have been looking for scheduling software we can install on our IIS server to manage our meeting rooms and equipment. I keep coming back to your product again and again! There is other software out there but nothing seems as nice or easy to use as what you offer! I particularly like the simple, easy to navigate Booking Request Form! It is close to 9 months since we implemented MIDAS ... Our experience with MIDAS and your online prompt support has been very good! We were very impressed with what your software has to offer! An impressive and intuitive piece of software, well done! Your service and support is excellent! Before MIDAS we were using a shared Excel sheet but we wanted to save time, reduce error rates and make the most of our rooms to maximize our revenues. MIDAS has been great and has been a huge time saver! I have been looking for something very cool and your product is the best out there! We're using MIDAS for a recording/editing facility - it's adapting itself very well, and going down a treat! So far I love this program, it's way better than YArooms that we tried last year! Our old Access database system was horrible! MIDAS is so much better and offers us ease of use and online access - I Wouldn't want to do my job without it! We purchased the MIDAS system last year and it has been working great! We are very happy with it! The MIDAS application is just SO MUCH easier to navigate, and so much more intuitive [than Meeting Room Manager by NetSimplicity]. I spent nearly all day Saturday playing with their product and I was very frustrated by the end of the day - and I could reach no one in service. You on the other hand have been wonderful! I almost didn't contact you because you are located in the UK and of course my immediate thought was - support issues. After dealing with the other 2 products [Meeting Room Manager and ScheduleVIEW], and comparing price, I thought I would give you a shot, one of the best decisions I have ever made! MIDAS was much easier to use and configure than I expected and it's a very comprehensive piece of software, definitely the most robust solution out there in comparison to the others I tested! Thanks for this product! It really does meet the needs we have for managing Church resources! MIDAS is being enthusiastically adopted by the different elements of our building ... All departments of our team seem happy with it and are continuing to find elements which make their own functions work better ... I introduced MIDAS to my caterers today and they love it! We are subscribers to MID.AS and think it is, without a doubt, the very best space booking system available anywhere! I have been working on MIDAS for a few days now and think its great and is going to be just what we wanted! When I emailed at 1:00am Pacific time in the United States on a Friday night, I didn't expect to get an answer until Monday. Thank you so much for the fast response [just 17 minutes] to our issue! I love this program! I've been searching for months for an appropriate one for my work. This is the best I've seen!! I adore it!! This software is amazing , well done! ...love your [tutorial] videos! The support has been great! It is fast and helpful. It is also good to see new features being released regularly. All in all, a great experience! Congratulations on a good piece of software! My clients are happy to work with MIDAS. One of the remarks I got was that it was so easy to work with. It sure made not only my clients life easier, it also made my life easier! MIDAS is making it easier for teachers to book meeting rooms and is better for our letting side of the business as it sends out emails when we book their club in. It is so easy and straight forward to use! MIDAS a multi-faceted app that has everything a venue booking business would need to streamline the whole operation. The desk diary and filing cabinet can finally be dispensed with! On Monday this week, we have finally gone live with MIDAS! ... All [90+] users were immediately comfortable with the new system, and are seeing the benefit of having requesting and visibility of bookings in one integrated system - The biggest positive I have thus far is that I have received no calls asking me how to use the system! You get a lot for not much money out of you guys - Keep up the good work! My users, who have just started training, think MIDAS is wonderful ... so well designed and so easy to use! You give the best customer support! And this is an amazingly easy, user friendly, robust software package. We are very excited to have found it! You guys are the greatest! I just love how responsive MIDAS support is! 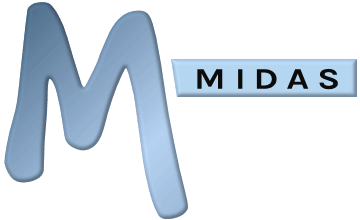 We are a fairly new user of MIDAS and really like it so far - very user friendly! We have recently purchased MIDAS ... and so far have found it to be the closest thing to what we need for our industry. The ease of use and flexibility are wonderful and there are a host of useful options!